Asthma is a chronic condition which produces sporadic and sometimes unpredictable attacks of shortness of breath, wheezing, and tightness of the chest. The first step to treatment is to understand the condition. 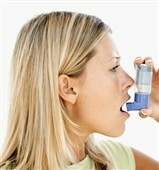 Asthma narrows a person's airways to the lungs making it difficult to breathe. In severe attacks, the lack of oxygen may produce a bluish appearance of the lips and face. Research has made it possible to treat the cause of asthma, not just the symptoms. Management of asthma has improved due to all the aids now available (nebulizers, peak flow meters and spacers). Asthma attacks can be triggered by such factors as allergies, viral infections, excessive activity, emotional stress, and second-hand cigarette smoke. Once the client has identified what triggers an asthma attack, they can take steps to get optimal treatment. Peak Flow Meter: This simple and inexpensive device is used to diagnose asthma. It measures a person's airflow ability. If one breathes into a peak flow meter, a pointer will be pushed up a slot and stop at the "Peak Expiratory Flow Value." For best results, the client should be in a standing position, take a deep breath in, and blow out as hard and fast as possible into the mouthpiece. This should be done three times, always ensuring the pointer is set at zero before each test. 1. The canister must be firmly in place. Shake the inhaler vigorously and remove the cap from the mouthpiece. 2. Sit up straight, with the head tilted back (this slightly opens the throat). 3. Exhale as much air as possible. 4. Slowly take a big breath, activating the inhaler at the same time. Hold the inhaler one inch away from mouth. 5. Breathe in as much of the mist as possible. Hold breath for a few seconds and slowly breathe out. 1 . Remove the cap from the inhaler and from the aerochamber. 2. Place the mouthpiece of the inhaler into the back of the aerochamber. 3. Hold both pieces together and shake gently. 4. Place mouthpiece into mouth and press down on canister. 5. Breathe the medication in slowly (over 3-5 seconds). Hold breath until you are no longer comfortable. As you breathe in, a slight hissing sound indicates that you have done it correctly. 6. Repeat steps for each puff needed. 1 . Fill the nebulizer. 2. Connect the nebulizer to the mask and tubing, ensuring all connections are tight. 3. Switch the compressor on. 4. When medication starts misting, place mask near nose and mouth, breathe easily. 5. The nebulizer should be disassembled and rinsed with hot water after each use. Let component parts air dry. Tubing, nebulizer and mask should be replaced monthly.